Gold mining in South Africa has a turbulent history with wars, conflicts being fought over its rich reserves and government unrest and takeovers devaluing the gold in South Africa. During the Boer Wars of 1880 and 1899 native workers were forced to work in dank gold mines and this cheap labor plus the high gold content of mines contributed to making South Africa the wealthiest nation on the African Continent. Currently South Africa accounts for 12 percent of the world’s gold production and is the second largest producer of gold. It is speculated that South Africa still retains at least 50 percent of global gold reserves. 1. Almost 500,000 people work in South Africa gold mines and gold mining represents almost 20 percent of South Africa’s yearly gross domestic. 2. South Africa gold exports claimed to be over $3.8 billion in 2005, but this has declined a bit in the last few years. 3. 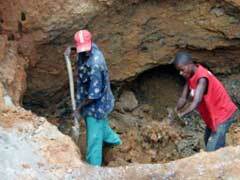 Gold mining in South Africa includes the two deepest gold mining concerns in the world. The East Rand Mine in the province of Boksburg as well as TuaTona located in Carletonville is over 3600 meters in depth. Rocks this deep are extremely hot and cooling technologies have been specifically developed to protect miners. 4. Black economic empowerment or removing Apartaid from South African politics has resulted in changing ownership of gold reserves and the devaluing of gold stocks. 5. Reports from the US Geological Survey in 2009, state that there are 6000 metric tons of gold reserves in South Africa with the majority of gold being mined in the Archaean Witwatersrand Basin. 6. At this point in time, gold mining in South Africa stocks are highly out of favor due to the expense of extracting gold from the gold fields, the deep mines, and the relative high value of the rand. 7. Mining websites are beginning to predict the end of gold mining in South Africa by claiming that most gold mines will be shut down within ten years. Gold mining supplies are at a premium in the gold fields of South Africa since most of the gold is deep underground and machinery, supplies and employees are at a premium. It is also a difficult time to mine gold in South Africa due to government conflicts. There are gold mining claims for sale in the Barberton Greenstone Belt and the Kraaipan greenstone belt outside of the main watershed mines. These claims are easier to mine, but the unrest in the provinces where they are located makes mining some of these claims highly dangerous.